There are a lot of unknowns about what's next. In an email exchange earlier this month, Saniuk-Heinig told me that they will keep the Sidewalk's longstanding live-music tradition alive, though she was not sure yet what type of music they'll feature. She also said that no decision had been made yet on the name of the establishment (perhaps Sidewalk will continue). In a piece posted last night at The Daily Beast, Anthony Haden-Guest writes that it was "a shock but no surprise to learn" about the change in owners. So why no surprise? Because in our Wealth Gap period, gentrification has become a seemingly unstoppable force. Saniuk-Heinig told the Daily Beast that they'd know more details on what's to come next month. The DB article also looks at the history of the venue's open-mic nights — the most active one in NYC. I would love for Sidewalk to be a real live music venue which is one that is standing room as well as sit down, and more than just folk, jazz, open mic, and poetry. Once gentrification is complete and the bro's take over, there will only be bars. Bro's can't think of anything more interesting than playing video games and drinking, so this kind of place won't attract them. Bro's kill culture the way the Vandals and Visigoths destroyed whoever was in their path. A lot of Sidewalk's continuing charm is that it is a no cover venue in back of a restaurant / bar that pays the bills. Every other performance venue these days, and there are only a few left, has a door charge. (Except the fantastic Treehouse of course) Sidewalk allows for casual attendance, which can occasionally lead to the curious and tipsy from the front room wandering back and dancing. The linkage with the kitchen makes it possible to sell the occasional entree to the tables that come through to see their friend's perform, and the restaurant is successful as unsuccessful or marginal restaurants close very quickly, unlike scraping by bars with or without performance. Unfortunately the reality of the current scene at Sidewalk and walking distance is that the musician and audience demographic is on the old side. There are occasional "kid" or young adult acts but it's mainly us ghosts from previous eras. The good side of that is attendees know to spend some money, put some money in the tip jar and tip the help. 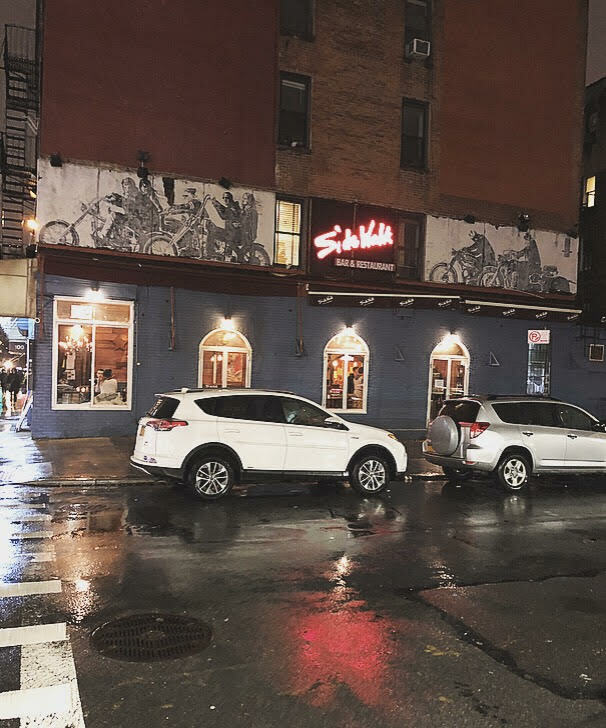 The live music has been a plus on Sidewalk's balance sheet, the expense is the single technician, and the foot traffic can only help the bar area. Now we're all very curious to see what happens. 5:52pm I get no cover, the charm of it cuz you don't have to pay but I value music i.e. I'm willing to pay for it so bands don't have to beg for tips. Most live music venues which have real live music - bands who play shows, tour, put out records, draw fans etc. - charge a cover. Manhattan lacks small standing room live music venues now. I think it's time Sidewalk becomes one of them sometimes. 1969, 1979, 1989, and 2009 are long gone, it's almost 2019. Time to support BANDS, too, not just soloists and duos. Rockwood is another great spot for live music...and 7 days a week. It's more the casual aspect of not having to commit to a "show" at the door, because then civilians, read: those maybe interested in something besides the bartenders Spotify playlist but who have no knowledge of any of the acts, don't have to make a decision right as they are asked for $10 off the top of their night-out cash. There are more clubs at all levels that have a door charge, but a cover necessarily excludes bands that don't draw (enough) to make it worth the venues while. Bowery Electric is a good venue but they necessarily need bands that can draw a certain amount of paying (and drinking) customers. There need to be spaces where musicians who are trying to play in front of audiences regularly can hone their craft, the chance to have strangers wander in and the opportunity to see what works with ears that aren't friends from work/school/etc. Sidewalk has had a large percentage "bands" for a while now. Many of the bands at Otto's, the other no cover back room band venue, couldn't sell enough admissions to justify booking them and wouldn't be to the taste of many casual music browsers. But maybe after a few shows they could improve, build an audience. Venues have to make a certain amount of money or it's not worth their while, they have rent and liquor distributors to pay or they aren't open next month, and I can only remember one bar in decades that was run as an occasional charity. Forcing a cover charge in the past has led to the exclusion of the local avant garde jazz scene and, in other cities more than New York, egregious pay-to-play arrangements. Sidewalk has been striking the right balance. Here's hoping that the new owners understand that becoming just another restaurant is a big roll of their dice. A very small percentage of new restaurants survive. Sidewalk isn't new and currently works where the restaurant and bar receipts are concerned so don't fix it. Oh so let's NEVER pay bands thus artists, right? It's ALL about making the bar money. Let's NEVER have new small live music venues either. We got Bowery Electric, whoopee - and what happens when they close down? Sidewalk can arrange to allow people to pay an admission and not pay one - it's called separate entrances. Unlike you I value artists' work and believe they should be paid for it. If a club holds 100 paid, my band draws that, we play for $7 (just us) for a 700 gross - 200 venue = 500 - 20 transportation (we have our own van and practice space) = 480 by five members = 96 net showpay per band member + another 20 net merchpay = 116 total net pay per member. Not much but it's a dent in the rent.